Beauty with a Twist: Glitter Party! Well, I'm trying out this Blogger app again. So far, my only issue with it is that it automatically puts all photos on the bottom of the post. Obviously not the best thing for tutorials... Earlier this week I posted my nail mail on instagram, I practically purchased the whole China Glaze Neon collection. The only ones I didn't go for were the 2 purplish colors and the bright blue. But Ride the Wave, the blue jelly? Alllllll mine! I hope to have swatches up soon. I couldn't resist wearing my new pretties right away! I used one of the hot pinks, Hang Ten-Toes, a glowy cool-toned pink. I used 3 coats, because I thought I could still see my nail line at 2 coats. 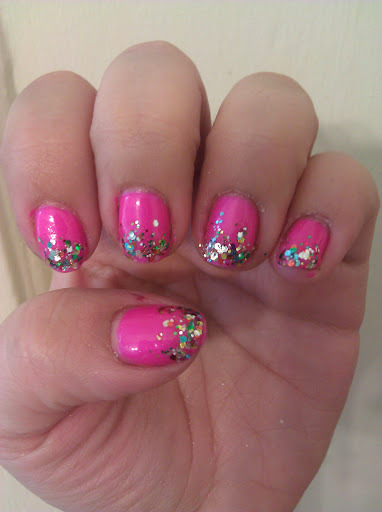 Again, because I couldn't leave well enough alone, I decide to add a glitter gradient. I used NYX girls nail polish in Carnival, basically a Deborah Lippmann Happy Birthday dupe (minus the square glitter) on my tips. Carnival is great color to get for the price, I believe it's less then $3 on Cherry Culture. However if you already own Wet n Wild's Party of Five Glitters, OPI's Rainbow Connection, Nicole's Rainbow in the S-Kylie (I think that's the name) or countless other rainbow glitters, this one isn't necessary. You can find me on instagram under ”liquorlubeandlipstick”, feel free to leave me your instagram in the comment area! It's a nice glitter party going on here - sweet mani! Thank you, it looked so glittery in the sunlight!